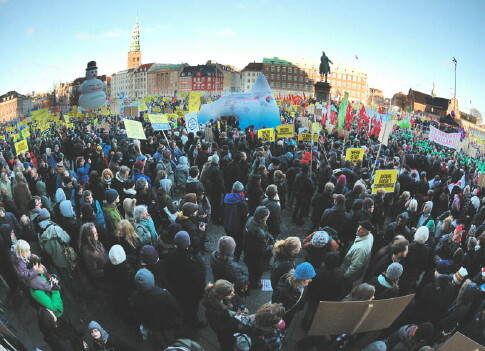 The huge square in front of the Danish parliament Christiansborg was from the very start filled with the flood and more and more people poured in. The official programme of the joint mass manifestation was supposed to start. Few could hear and even less could see the speakers in spite of effective loud speakers. There were simply too many people and very many things and messages to look at. 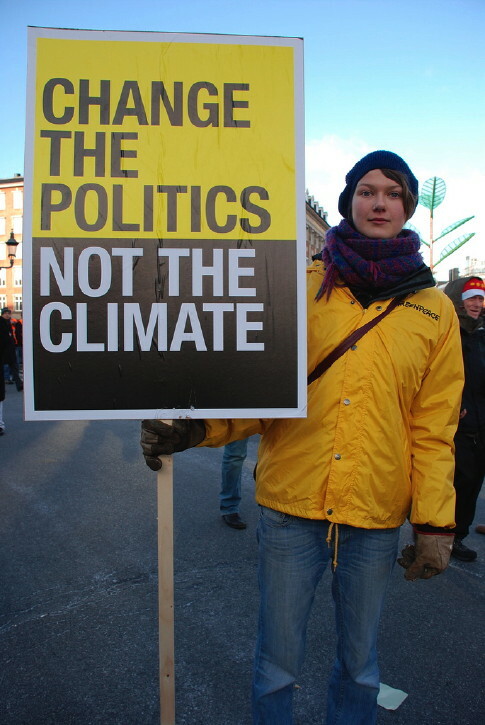 A forest of yellow placards filled the air stating “Nature does not compromise”, “There is no PLANet B”, “Bla Bla Bla .. Act now”, “Change the Politics not the Climate”, and “Climate Justice Now”. These were messages that people had stated as important when Greenpeace made the unusual experiment and asked people to suggest slogans via their website and then produced the most popular. 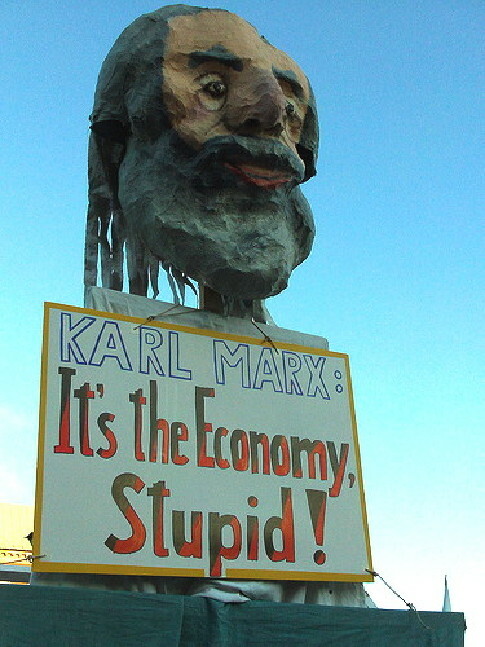 A gigantic Karl Marx roomed around with the message It’s the economy stupid, an angry mermaid together with children dressed up as mermaids was swimming in the air and the banners of climate movements, environmental organizations and political parties filled the cityscape. Many had creative dresses of varying sorts which they had done themselves while the resourceful organizations made their stunts with equally dressed people and professionally designed banners and other material. The flood starting at Halmtorvet. 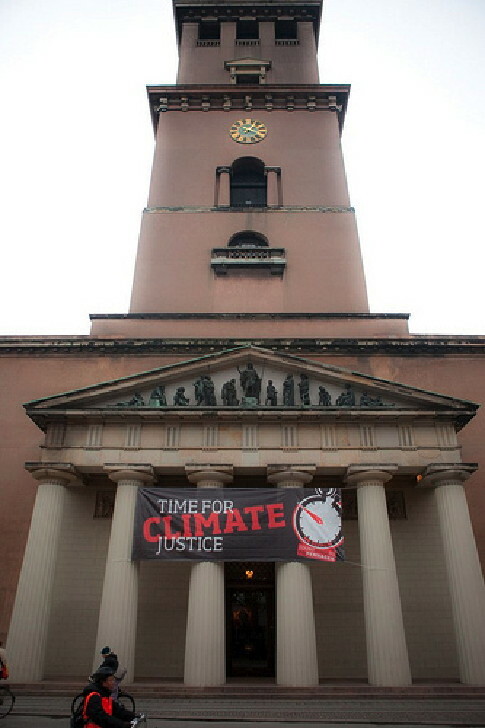 It all started at Halmtorvet close to the main venue of the Klimaforum. 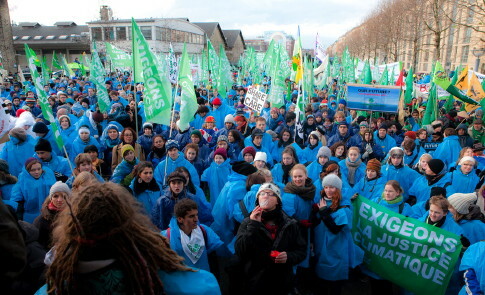 Here thousands of activists dressed up in blue ponchos, some as polar bears, penguins or plain clothes demonstrators. It was the flood action organized by Friends of the Earth International with the support of Via Campesina. 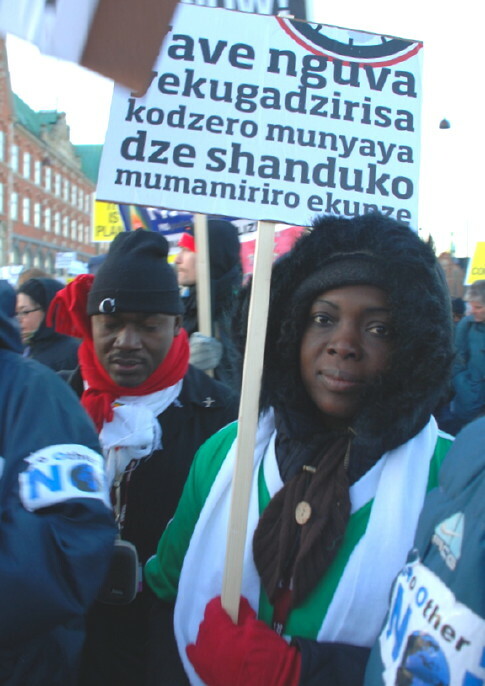 The two thousand FoE members coming from abroad had been supplemented by many more Danes and fellow activists making the march lively with some 5 000 participants. The sun was shining, the mood creative and the message clear, not to false solutions! 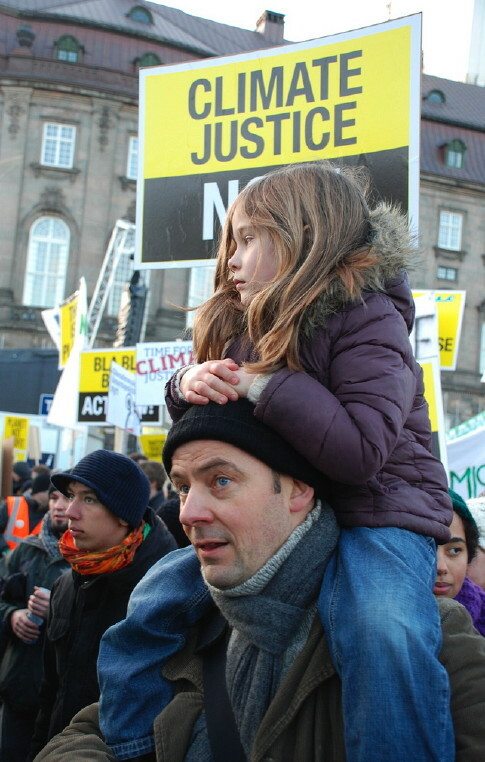 No to offsetting with global carbon trading! It all ended in front of the former castle Christiansborg and now parliamentary building with speeches by Henry Saragih, general secretary of La Via Campesina International, Nnimmo Bassey, chair of Friends of the Earth International and the participants making a Mexican wave to flood the temporary carbon trading exchange which could not resist the pressure from the people. Other feed in activities contributed also to the mass demonstration. “What do we want? 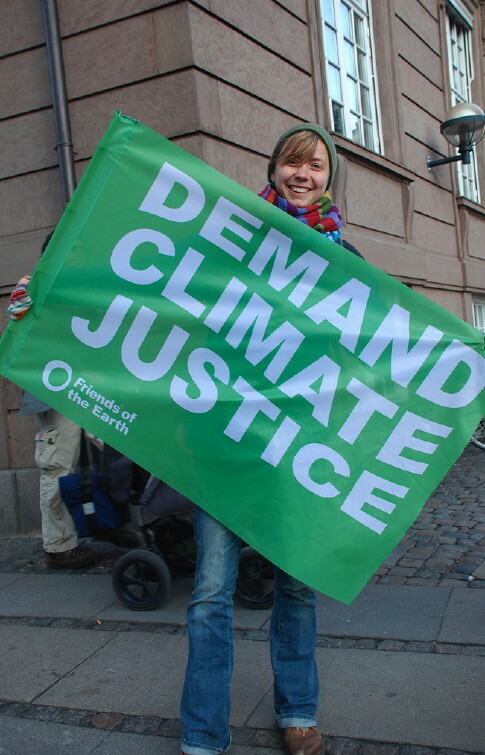 – Climate justice! When do we want it? – Now!”. This was the chanting when World Council of Churches gathered with cooperation partners eported on a Swedish Diakonia activist blog. 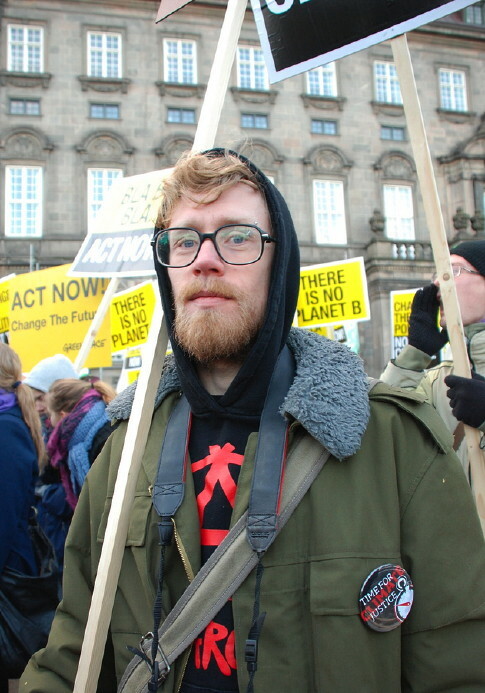 ”It was a nice feeling of inspiration that was spread in my body when we yesterday met at the Vor Frues Plads, here in Copenhagen, for the big demonstration. People from different countries who all were involved in the Countdown to Copenhagen campaign. Now it was finally time! 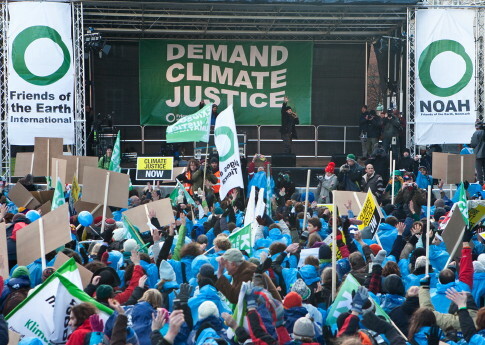 Placards bearing the campaign slogan “High time for climate justice” in a variety of languages had been printed up. So began the long journey to the Bella Center.” From the Bottom meeting Windows of Hope at Christiania people joined the demonstration later in Christianshavn. The chair of the Danish Social Democratic party followed, Helle Thorning-Schmidt and the Danish artist Thure Lindhard and Helena Christensen, a model and photographer. 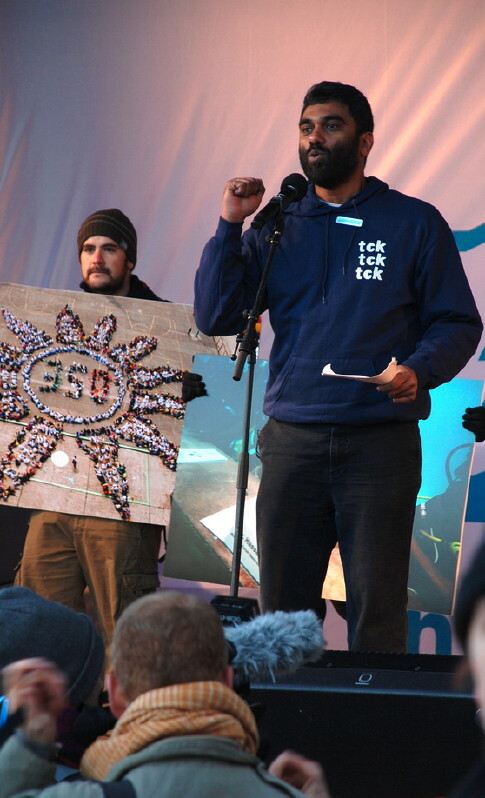 Kumi Naidoo, international general secretary of Greenpeace and chair of the tcktcktck campaign from South Africa made a speech and presented climate witnesses from Uganda, Bangladesh, Tibet and Kiribata. Singing and speaking was also Angelique Kidjo born in Benin in West Africa, ”a Grammy award-winning music recording artist deemed “Africa’s premier diva” by Time Magazine.” according to the official web site information. People were chanting, singing and dancing. Not many could here the speakers but there was very much other things to do. Hundreds and hundreds of different messages on banners and huge stunts of different sorts ranging from NGO lobbyists to anticapitalists. 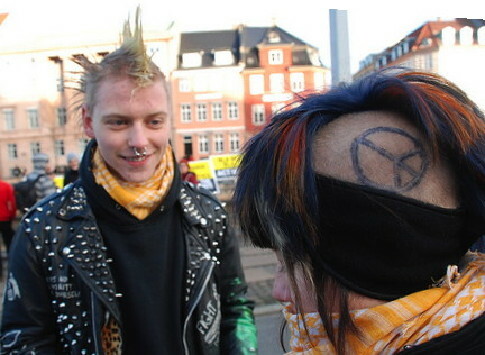 The protest involved mainly youth. Jubilee South and Action Aid called for reparations from the First World to repay their ecological debt and aid sustainable development in the Third World. 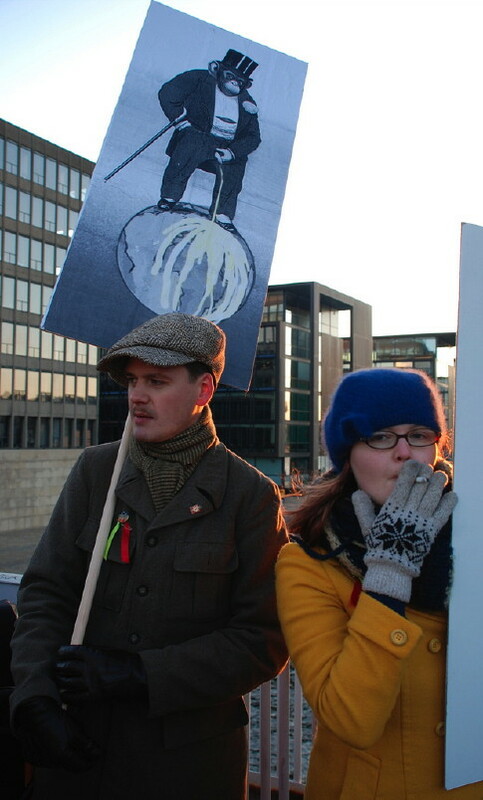 A satirical contingent of green capitalists raised the issue of greenwashing —dressed tastefully in white, they carried platters of grapes, glasses of champagne and placards reading “Greed is green“, “Bangladesh: buy rubber boots“, “Stop global whining”, “We heart green capitalism” and “We love green, but we love fossil fuels more”. The lead banner screamed, “Carbon trading: the final solution”. 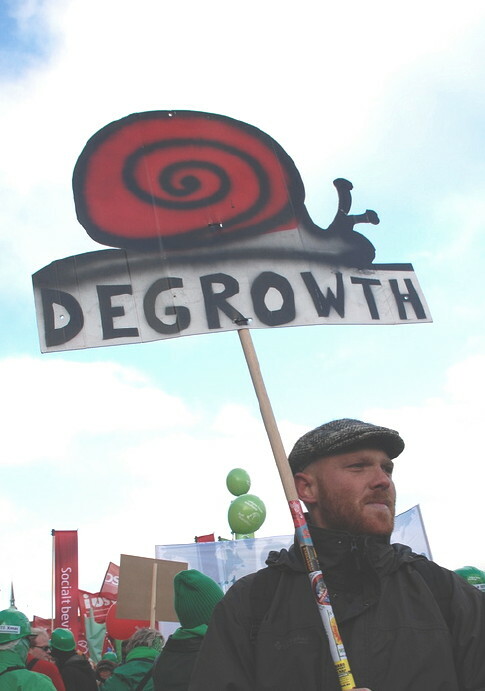 One faux banker urged the crowd to “go home and buy some carbon offsets”. The demonstration was on the move. Tens of thousands followed the indigenous in the front along the stock exchange and across the bridge towards Christianshavn and the South. 41 different blocs were in the demonstration but the decided order was seldom followed. After the indigenous came a banner stating Politicians talk, leaders act with the Greenpeace bloc including both a huge snowman and a globe with a lifebuoy. Then followed the rest of the tcktcktck campaign with 350.org and a van for the Socialist People’s party surrounded by blue balloons with the party logo. After a while followed a new van surrounded by lively social democratic youth from Sweden singing Bella ciao socialists sons from Italy. 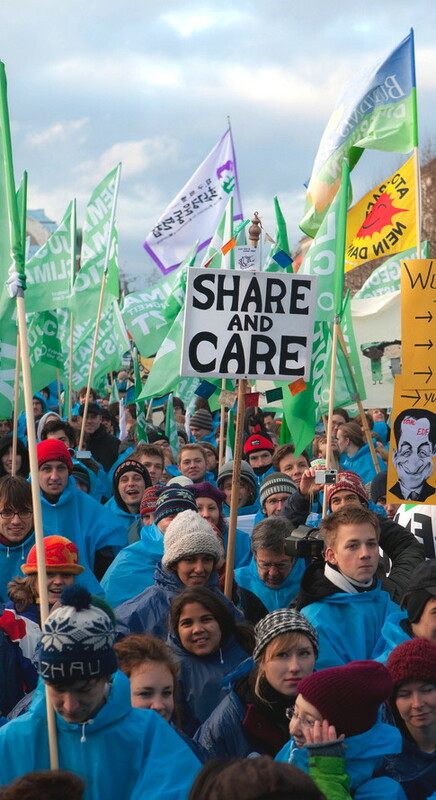 Soon after Lega Ambiente from Italy and others proudly carried the yellow Don’t Nuke the Climate banner. Spread out were peace organizations and supporters of liberation of countries as Tibet or Iran. 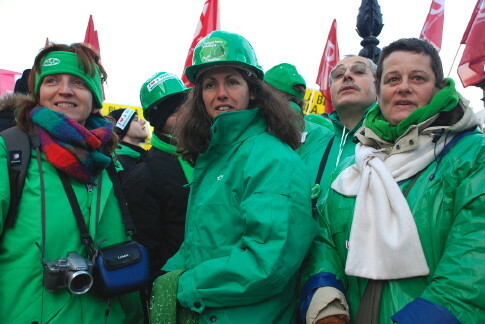 Especially popular was the union bloc with a front banner stating Just transition and people all dressed in green including green helmets. Their popularity along the road was raised as they stopped and then started running quickly. 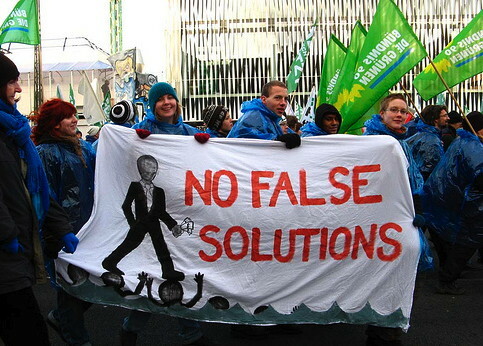 After the union came a banner stating Greenwash warning – Stop false solution made by Friends of the Earth Sweden and then a variety of messages including Radical Climate policy – now or never! WWF followed between red flags with the message Vote Earth for a real deal. 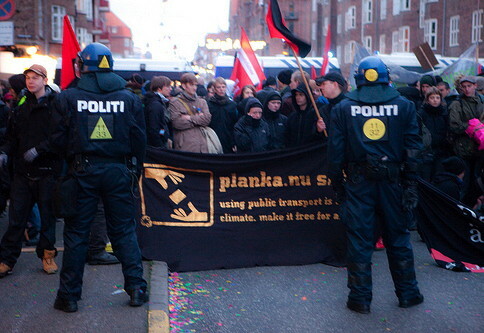 A van stating system change not climate change and a banner long after stating the same followed with Socialist parties as the red Green Alliance and the New Anticapitalist party NPA from France. Soon after Attac came carrying a banner saying “Don’t let corporate lobbying destroy our climate” together with groups from everywhere including the libertarian socialist bloc. In the end came development organizations as Action Aid and others. Thus the march had started in a bit of chaos but anyway managed move forward to the South. Meanwhile at Højbro plads, gathering place announced by Never trust a COP, many hundreds or almost thousand was faced by many policemen. The police started to ask if not NTAC wanted to go along with the march that was not far away but in the opposite direction from what was stated in advance. When unwillingly moved towards the main demonstration the black dressed people from the NTAC gathering got a bit dispersed. One bigger part came straight into the Action Now bloc consisting of left wing parties as Red Green Alliance, New Anti Capitalist Party from France and other like minded organisations walking in front of the Climate Justice Action bloc. This caused some confrontations including an incident when one person dressed in black was beaten to the ground by someone in the Action Now bloc. The black dressed newcomers were not especially welcome and able to create disorder in the bloc partly separating it. Soon also stones were thrown at windows at the stock exchange. 9 double windows were broken. Soon after passing a bridge one window was also broken on the foreign ministry at the Christianshavn side of the harbour, a police van was hit and things like firecrackers fired in the direction of the police but no reports state that this did any harm. After these incidents the situation calmed down and the police did not intervene here or later against this part of the demonstration. Another black dressed group that all along had planned to participate in the main demonstration walked far behind at the end of the large joint system change not climate change section starting with the CJA bloc. After CJA followed among others Friends of the Earth with a sizeable delegation, Via Campesina and movements from the South, Attac and a socialist liberationists bloc were some were dressed in black. From somewhere in this last part of the demonstration one bank window was smashed at the central square in Christianshavn. 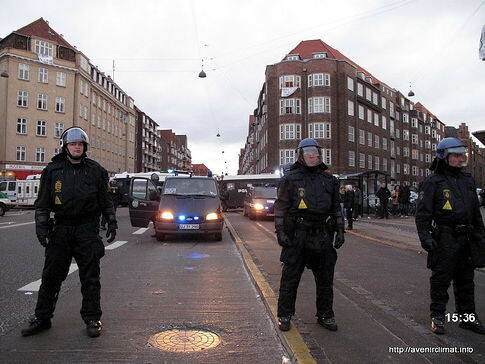 Half an hour later after passing one more bridge leaving Christianshavn and walking into the Amager district this part of the demonstration was seeing themselves surrounded by heavy police equipment on the Amagerbrogade. The more experienced were able to escape in advance suspicious about the many police vans around. Soon the whole part was stopped very fast by police vehicles that blocked the demonstrators from leaving both from the back and from the front. Only one way was open seemingly without any police in sight. Here a black dressed group started to move quickly soon to be trapped by the police. On Amagerbrogade many people were in quite a good mood as they believed the demonstration only was temporarily stopped by the police as none had seen any immediate reasons for the police to intervene and very few any unruly things happening in their part of the demonstration all along. Soon all the rest also on the main street one by one got handcuffed and put into degrading positions shaping line after line in so called fishbone rows. 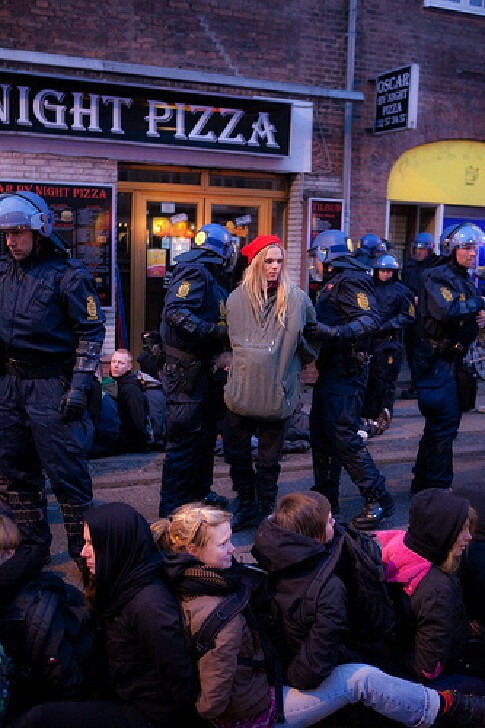 People who had escaped into shops and restaurants were dragged out and all arrested. Some very few were allowed to leave as TV crews and a few other special cases. Outside the police cordon the reactions were different. At the Bella Center for the first time the TV monitors showed constantly for many hours pictures from the outside world from above on the mass arrested hundreds and hundreds of demonstrators sitting in their fishbone positions hours after hours while delegates looked upon the presented situation. On the street the police had cut the demonstration so both parts of the Attac and the socialist liberationist bloc were trapped but also very many demonstrators of all other kinds as some members of Friends of the Earth, young conservationists, people’s high school students, Hare Krishna nuns, well dressed concerned climate protesters in suits belonging to no group, people from all parts of the world etc. What kept the spirit high was the samba orchestra. Let them go! Let them go! Let them go! the chanting sounded across the police vans between the walls while the drumbeat was shaking the bodies and warmed the hearts. The organizational flags most present outside the police lines were from Attac. Quite a group stayed behind to show their solidarity with those inside the police kettle. The CJA loud speaker van tried to return to the spot of the arrests but were forced by the police to leave and continue with the main demonstration towards Bella Center. 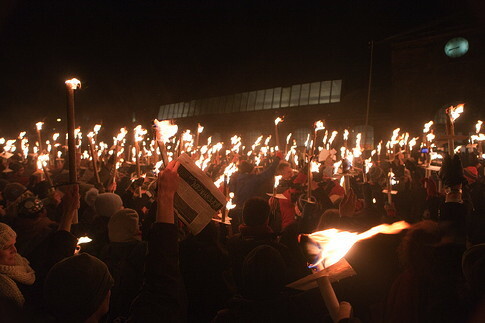 The very last end of the demonstration was directed outside the kettle and joined with the main demonstration. 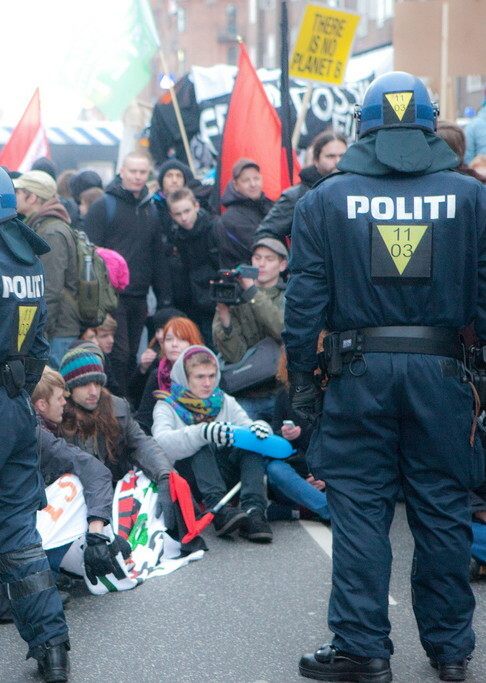 The main demonstration in the hands of the Danish organizers did not bother. 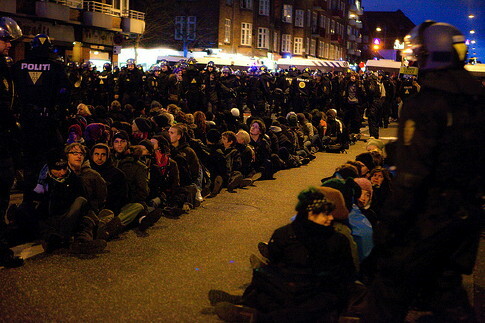 On the contrary were the only reported appeals against the mass arrests made by the CJA van outside Bella Center. Instead the demonstrators were welcomed by disc jockeys and a speech by Mary Robinson, who also started the candle light sea as a sign of hope. The crowd was so huge that most could not see the platform or hear the speakers — instead, the demonstration became a candlelit street party. 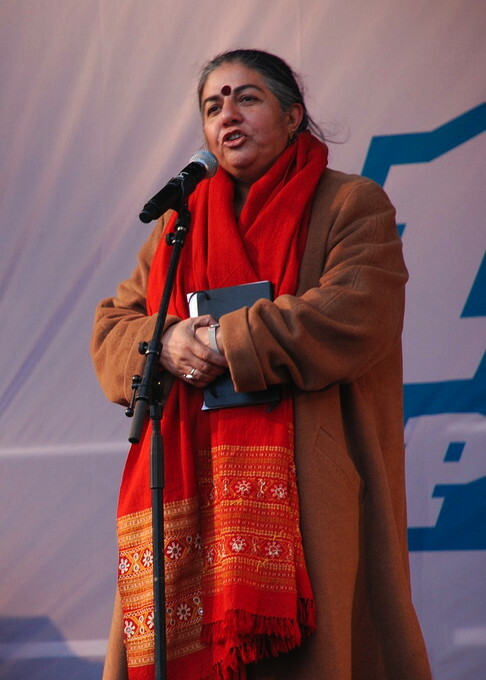 Speakers following Robinson were Deepa Gupta, from the lobbyist group inside the Bella Center, Indian Youth Climate Network made her speech before Tom Goldtooth from Indigenous Environmental Network in the US made his contribution. After him followed three Danish parliamentary speakers; Margrete Vestager from the social liberal Radical party, Villy Søvndal, party leader of the Socialist People´s Party and Johanne Schmidt-Nielsen, from red Green Alliance. The parliamentarians were followed by João Felicio, from the trade union CUT in Brazil, speaking on behalf of ITUC, Helen Caldicott, anti nuclear power veteran from the US, Ian Terry, Vestas-worker from Isle of Wight, Lidy Nacpil, from Jubilee South and the Asian Pacific Movement on Debt and Development, the Philippines and ending with Nnimmo Bassey, chairman of Friends of the Earth International, from Environmental Rights Action (ERA), Nigeria. Finally a reused sail with climate messages was delivered to the negotiators represented by the head of the UNFCCC secretariat, Yvo de Boer. Meanwhile the front of the demonstration celebrated its political awareness and peacefulness while sending signals to the politicians inside Bella Center at Amagerbrogade the part of the demonstration left behind in the hands of the police were more and more treated in a degrading manner. ”People fainted, vomited, lay in their own vomit and urinated on themselves when they were refused to go to the bathroom. One guy was unconscious for an hour before he got help. The atmosphere was very unpleasant, and those who stood up because they were unable to sit anymore were brutally suppressed. Victoria and Olof had to stay tied on the icy sidewalk in very uncomfortable positions for more than 4 hours and Olof then transported to jail (as one of the policemen called “Denmark’s Guantanamo”) where he was forced to sit in the intolerable position in several more hours, still without food, water or access to toilets.” – Witness report from Anton Törnberg, Siri Sandin, Viktoria Viklander, Olof Öhrn. Countless reports made similar statements. In total 918 people were detained. The police had problems transporting the detained into the special prison set up for the occassion at Valby with cages inside a big warehouse. People were thus forced to sit on the cold ground for 4-5 hours. Also the media was more severely effected then normally. Main stream press and TV reported that unnecessary violence was used when they were taken away from the scene, that policemen consciously blocked the possibility also to cover what happened with tele lenses and that camera equipment was broken by the police or even that journalists were beaten by the police. Mogens Blicher Bjerregaard, head of the Danish Union of Journalists, demanded a meeting with the chief of police, and says in a statement that he’s never seen so much criticism of the police at the same time. The head of the police operation Per Larsen told the press that he was sorry if some innocent people have been subject to mass arrests, but that a rapid and consistent effort had been necessary. In a press statement the police explains the reason for the mass arrest: “As a background to the decision to detain the violent group of demonstrators was also to be taken into account the great importance of the large popular demonstration to not be disturbed by people with another agenda,” Thus the police claimed that it was unfortunate that some innocent were among those mass arrested as those detained was a violent group that was a threat to the great demonstration, or as Larsen put it on TV, the dignified manifestation in contrast to the violent group that was necessary to detain to maintain order. The situation was open for the organisers of the demonstration to state if they shared this opinion of a mass arrest of almost one thousand demonstrators. 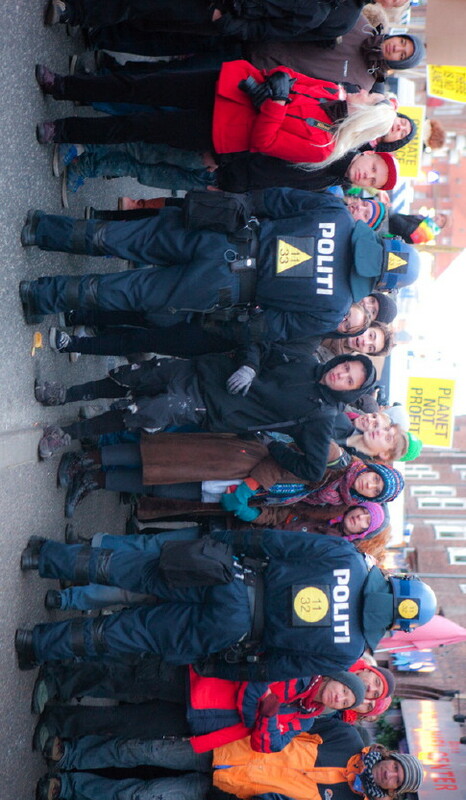 At Christiania on a distance from the demonstration route and after the mass arrests took place some confrontations started with the police. One policemen was hit by a cobble stone but it soon became clear that he was not seriously hurt contrary to some first speculations in the media. 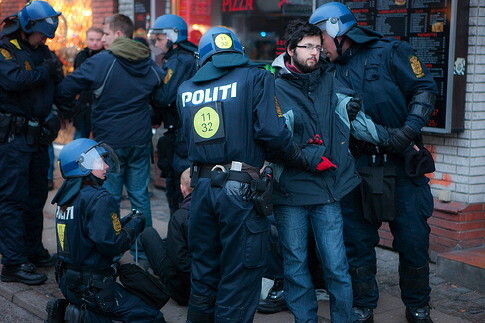 One Swedish activist was also slightly injured as a two-inch firecracker he was carrying exploded. Four cars were set on fire. 55 people were arrested in these confrontations. 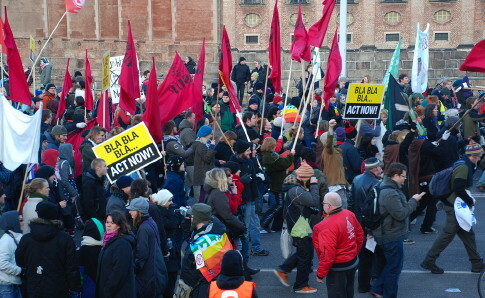 Outside the prison there were also protests by people following the call of CJA and some Danish youth left wing organizations. 250 demonstrators demanded free the political prisoners and were met by a strong police force that used their sticks only once keeping the demonstration 300 meters away fro the prison. One person was arrested.